[DJ Sures] sent us his most recent hack, and it’s one that is sure to please those who enjoy a good dose of 80’s nostalgia. He located a Tomy Omnibot on eBay and snatched it up immediately. While he was waiting for it to arrive, he planned out what he would add to it once it showed up at his door. Once the robot was delivered, he cleaned it up, painted it, then got down to business. The original robot had no ability to move its arms or head, so he immediately added servos to enable those actions. 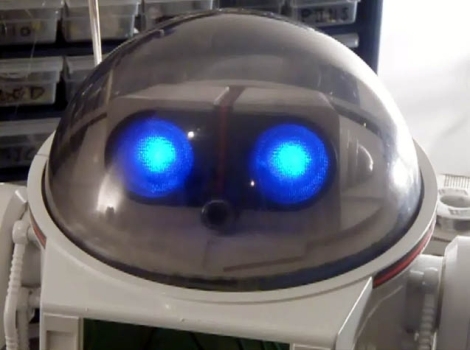 A wireless camera was inserted between the Omnibot’s eyes, and a wireless mic was mounted in his chest. He has also added some features found in his previous projects, such as voice recognition, visual recognition, voice synthesis, and the ability to remotely control the bot. He plans on adding an ultrasonic ping sensor and IR floor sensors in the near future. This is a great build so far, and it sounds like he has plenty more in store. Be sure to stick around for a video of the robot in action, and if you are interested in some of [DJ Sures’] previous work, check these out as well. Nice build, nice time-lapse video. It makes me regret taking apart my mobile armitron when I was 5. My reassembly skills were lacking back then. There is a second video up now! I remember wanting one of those so badly, and now I do all over again! I had this same robot when I was a kid. The remote had one button. Press it once and he’d roll forward, press it again and he’d back up and turn. About a decade later I gutted him, sealed all his seams, and added an air pump with a switch mounted on his back to turn him into a bong. Aaaaah the 80’s… when I thought robots like this one would actually do useful things around my house for me….